On Tuesday 30th March 1875 the Penzance Choral Society, assisted by the 32-strong orchestral band and by bro. Rd. White at the organ, gave a performance of Mendelssohn's oratorio Elijah, which the Royal Cornwall Gazette considered to be the best amateur rendering of this piece to have taken place in Penzance. The esteemed Mr. J.H. Nunn, ARA, was the musical director. Most unusually, but very sensibly considering the demands of the role, the part of the prophet Elijah was taken by two baritones, one for the first half: Mr. William Wills; and one for the second: Mr. Stephen White. Both acquitted themselves splendidly; it was Mr. Wills' first appearance as a singer in Penzance. The tenor soloist, Mr. J. C. Trounson, heroically stood in after only a few days' practice when the intended soloist went down with a cold. Mrs. Nunn was one of the lady soloists. The concert was held in St John's Hall, which had been completed eight years before. 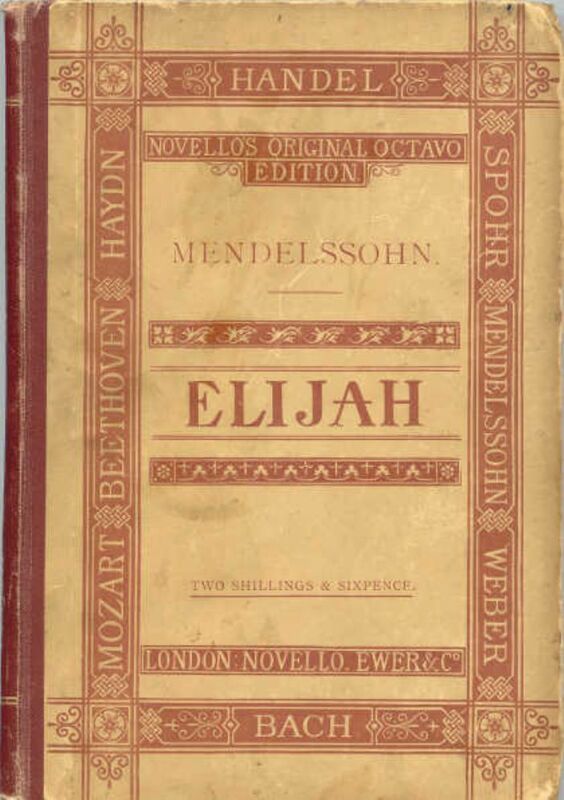 Mendelssohn's Elijah premiered in 1846, in Birmingham Town Hall. The oratorio tells the story (from the First and Second Book of Kings in the Bible), of the eponymous prophet and his struggles with King Ahab (husband of the more notorious Jezebel). Elijah has accused Ahab of straying from the worship of the true God Yahweh, and worshipping Baals, or nature-gods. In order to demonstrate the error of Ahab's ways, Elijah sets up a contest between God and the Baals, in which both are invited to send down fire from heaven and ignite the offerings which have been put out. The 'Baal choruses', the calls to the pagan gods, and the silences which ensue when the Baals are unable to respond, are very exciting. Elijah then calls upon the real God, and the heathens are roundly defeated. The story also tells about a three-year drought, a raising from the dead, an apocalyptic vision of God, and Elijah's own death in which he is taken up to heaven in a fiery chariot. All of this is related in Mendelssohn's lyrical style, with lavish orchestration (including an organ part and plenty of brass), with wonderful choruses and some very touching arias, trios and quartets. The whole work is intensely dramatic and has often been popular with amateur choral societies, but its style is, admittedly, very mid-Victorian and this has not always been in favour. It needs to be performed with great conviction and some panache in order to make it come over to the audience properly, and I'm sure that Mr. Nunn provided this in 1875. The Penzance Choral Society performed Elijah again on Friday May 19 2017 in St Mary's Church in Chapel Street, Penzance. This 'On this Day' piece was written and researched by a member of PCS who sang in the performance which was directed by Mr Tim Hosken.